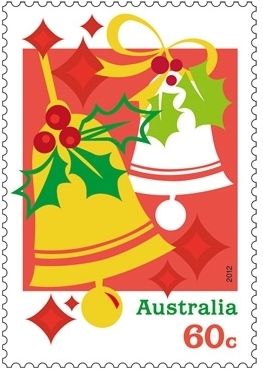 What is with the ugly Christmas stamps? They are beautiful. Images from a wool and silk tapestry at the Art Gallery of South Australia depicting the adoration of the Magi. Traditional, yes, but also elegant, rich and beautiful. I understand that we live in a secular society and that there probably needs to be some "non-religious" offerings on the philatelic front. I don't have a problem with that. What I have a problem with is the fact that they are ugly stamps. The naive style is supposed to reflect a child's excitement and wonder at Christmas time. So how come the stamps look like some cheap banner decorating a tacky shopping centre? Puke. 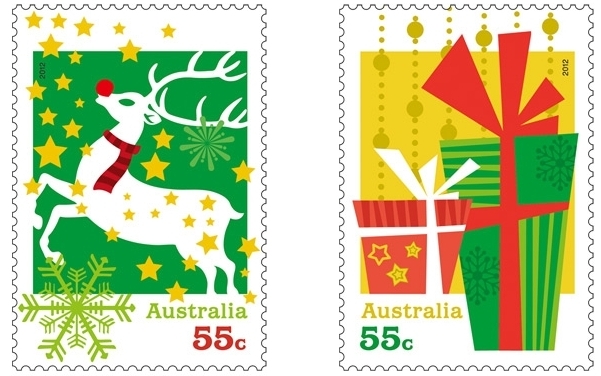 Now I think these are Christmas stamps worth getting excited about. To be fair, my favourite of all are the tapestry stamps from our issue. But in terms of naive style, the Europeans have it. Perhaps something to aim for next year, Australia Post? PS. I am totally available should you wish to hire me. 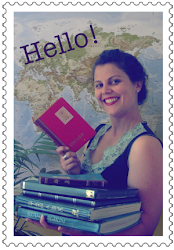 I am a historian, so could research your stamp issues. And as a bonus I could give you design advice: Helen's 'hot or not?' for stamps. You know, if you want. *Images stolen from the Australia Post shop. Should you wish to purchase the ugly stamps (although I would highly recommend the beautiful ones), check out this link. I come from Spain, but I'm currently living in Morocco so... no Christmas stamps here! Thanks so much for sharing the Spanish Christmas stamps. It is interesting to compare them... Well, I do like the Adoration of the Magi as a theme, and I really like the medieval image that is used in that stamp. 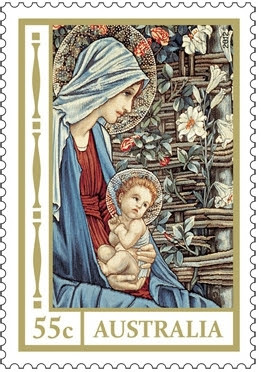 As for the second Spanish stamp - the modern depiction of motherhood as a symbolic reference to Mary and Jesus - well, it's an interesting take. And the stamp itself is quite nice. But it does seem a little odd as a Christmas stamp. But both the Spanish stamps beat the ugly Australian stamps in my book!! In the last years, it's always a depiction of motherhood as Christmas stamp for Europe (0,70€), and a classical reproduction as Christmas stamp for Spain (0,36€). I suppose it's because, as you wrote, we're in a secular society. But I can't see the point to made a "non-religious Christmas stamp". That is a nonsense, isn't it? Don't thank me for visiting your blog, as I like it a lot! Yep - I agree! It is a bit of a nonsense! 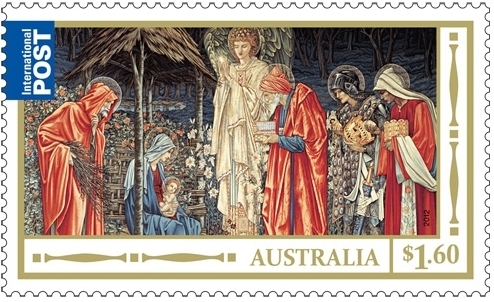 i agree with your criticism of the tacky Australian secular offering but also admire the Pre-Raphaelitish offering. Australia post would be wise to hire you as their design adviser and historian. You would truely be in 'Iheartpost' heaven.....but would the world of archeology survive with out you? I really do hope that you actually sent this letter to Australia Post. It made me smile. I think I just might send it Sandra! After all, snail mail is surely the only option when it comes to communicating with Australia Post.